A man and a voice to be remembered, di man Garnett Silk who pass over while trying to rescue his mother outta dem buring house. Though his music is kept alive by numerous compilation album including two collection of his dubplates. 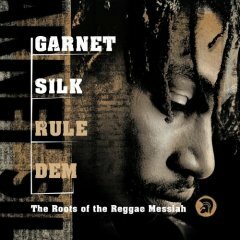 Di first one called Kilamanjaro Remembers Garnett Silk (Jam Down 1999) an this one by Trojan Records (2006) renamed Rule Dem. Feat. artists on this album are Dennis Brown on SING WITH ME, and Luciano on RULE DEM. JARO RULING” with Lukie D, Capleton on RESPECT JARO and COMPLAIN and Richie Stephens on FIGHT BACK and THE HARD WAY. Raspec to producer John Masouri for this 23 track compilation album, released on may 23 of this year. So good to hear the sweet, powerful and captivating voice of the man Garnett Silk.